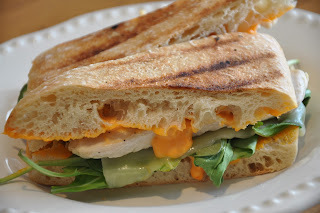 Today, I am sharing one of my favorite healthy sandwiches! I normally eat one half for lunch and save the other half for the next day! These sandwiches are wonderful hot or cold! Enjoy! Combine mayonnaise and chipotle pepper sauce in a small bowl. You can use any hot sauce, sriracha or chipotle tabasco would also work; season to your taste. Spread the spicy mayonnaise inside the ciabatta. Lay the provolone cheese, grilled chicken and arugula in the bread; close and lightly spray the top with cooking spray.Place on a panini press (or your George Foreman) and close until the cheese melts and the bread is toasted. Cut in half and eat immediately.